Sunday’s race left me with an inspired feeling for wanting to train specifically for a 10K race. I’ve been talking to Laura about it all week because I find the 10k distance so interesting. For starters, the 10K race distance is not a super popular race offering and I beg to wonder why! In my opinion, a 10K is a great race distance to run. It’s longer than the 5K so you don’t have to run ALL OUT and feel like you want to VOMIT. For me, signing up for a 10K race also feels worth the effort of registration and getting myself to the start line. When I think about a 5K, signing up to drive somewhere to run for a little over 20 minutes really isn’t what I want to do. For 6.2 miles though, I feel like it’s a great workout and worth the schlep to the start line. Anyone else feel this way? The 10K race distance is also NOT the half marathon distance, which requires a lot more energy and time. 6.2 miles are killer for sure but in such a different way than 13.1 miles. And, recovery is much quicker too. I’ve never trained specifically for a 10K and I’ve never really practiced my 10K pace often enough to naturally start to find it, and hold it. Over the last bunch of years, I started to develop a natural progression to my half marathon pace. As my running ability and endurance increased, my half marathon pace became clear and somewhat easy (relative term) to hold. But jumping to my 10K pace is definitely not as natural. But I want to be able to speed up and hit my 10K pace, and hold it better than in the past. Laura tells me that my 10K pace range is 7:40 -7:45. While I do see that average pace on occasion and ran around that range in my previous 10K races (and my 10K PR might have been even faster, not sure how I did that! ), I want to hit it and hold it comfortably for a race now. It’s on my list to work on through some running workouts, with two possible 10K race choices for the fall. More on that soon. In other news, I shared this photo on social media the other day as my documentation of the face of a girl about to run her last race in the 35-39 age bracket. I wonder if I will look back at this picture when I am 49 to say OMG look how young I was at 39. Isn’t that always how it goes? Like if I saw a picture right now of myself at 29, when I thought I was old, I would laugh about I young I was. We usually don’t see ourselves the way we should in the moment. Do you see the photo collage of my son hanging on the wall in the background? I’m one of those moms who likes to hang a lot of pictures of her baby. We have a few photo collage frames around the house, including one in my bedroom. I don’t like to plaster his face all over social media but I do like to plaster his bunny face all over my house. 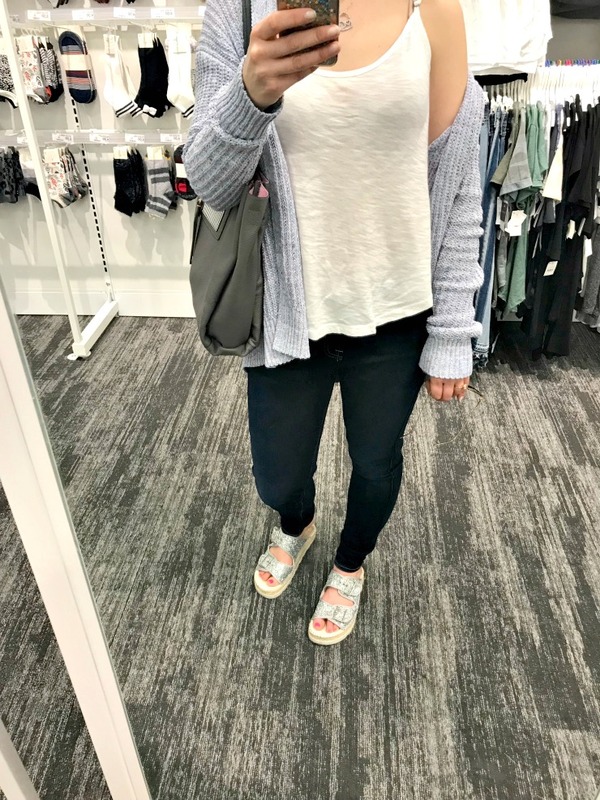 That’s the Gap long cardigan I told you about a while back which I love but still can’t find the link to online! Ugh, it’s one of my favorites. And that black Splendid camisole? I am OBSESSED WITH IT. I have the Splendid camisole in white too (see below) and keep trying to order it in pink and navy but I’m having a terrible time locating those colors! You need my favorite camisole in black and white though. Trust me. I think my favorite part of the camisole is that the straps are adjustable. I’m able to make them as small as I want which is a huge selling point for me as I’m pretty petite, especially in my shoulders. Bloomingdale’s is currently 25% off!! 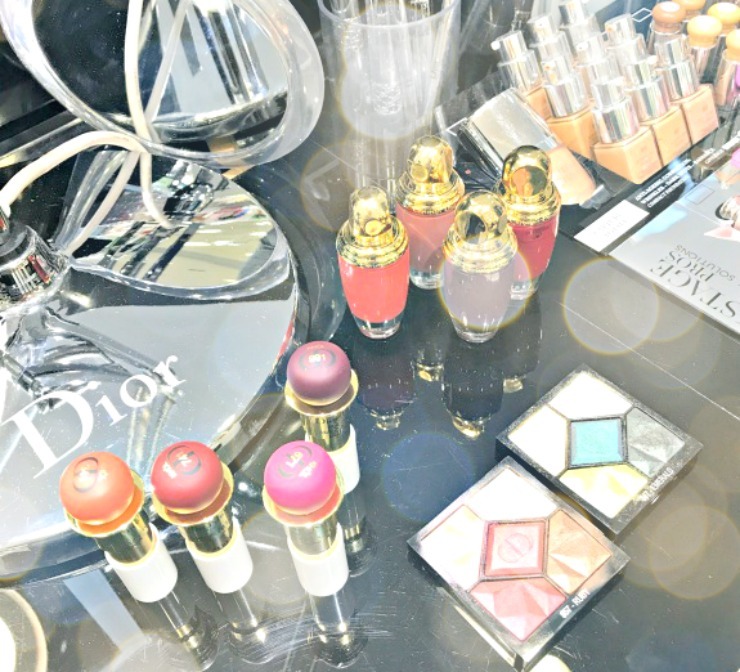 And just another reminder for local readers, I hope you can join me next Saturday May 19 for the Dior Beauty & Skincare 101 event! I know that a few of you are running the Brooklyn Half Marathon which means you can’t make it so my plan is to organize another event in the coming months. Have you ever trained specifically for a 10K race? What’s the next race on your calendar? Do you like to run summer races or do you hold off now until fall? I’ve never trained specifically for a 10k but it has been something I’ve thought about on and off. It seems like a good distance to work on endurance and speed. I like the adjustable straps on those camisoles! A bunch of my camisoles are Banana Republic and the straps don’t adjust, which can be annoying sometimes. I’m so excited for you to train for a 10K! 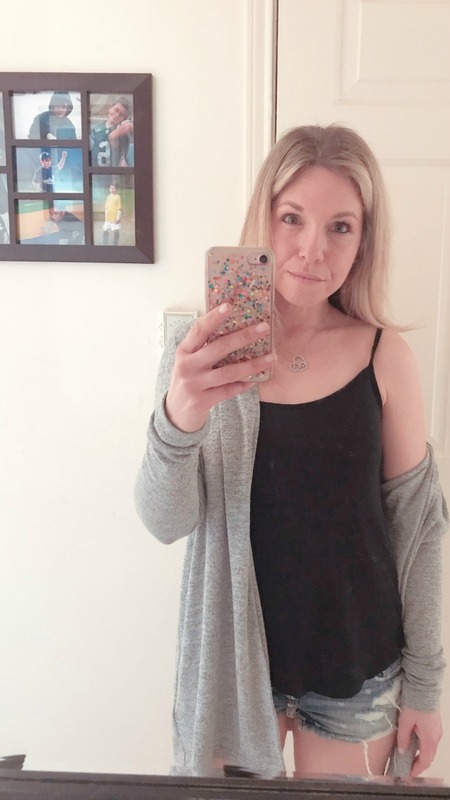 I really recommend this camisole – it has the greatest fit, it’s so comfortable, and the straps adjusting makes it absolutely perfect! And, it’s a great price. You gotta find that Gap link because the cardigan looks fantastic. Also: I love the 10k distance. I haven’t run a 5k race for the same reasons… it’s too much of an effort to get to the startline for <30 minutes of running. The 10k however is always a good effort run/workout. I know, I wish I could find the link but the Gap never had it on their website! Nice outfit and Dior product.